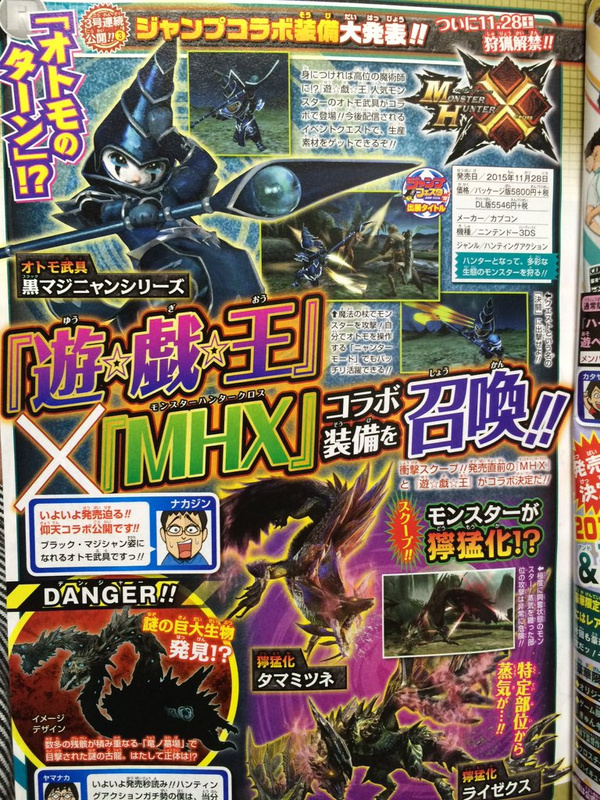 The latest issue of Weekly Jump reveals that the forthcoming 3DS title Monster Hunter X will allow players to dress up their Felyne Palico as a Dark Magician from the popular Yu-Gi-Oh! series. Known as the "Dark Maginyan", the costume will be obtainable via an event quest. This is likely to be the first of many costume collaborations for the game. Monster Hunter X launches in Japan on November 28th in Japan. Hell yeah, that's awesome. Please, please, please localize this game! I didn't even know I wanted this till now. @DarkSynopsis I know right? It looks pretty neat, really hope this comes over. A Dark Magic Attack right in PC's face. Also, now I have an excuse to yell "NOT SO FAST! YOU'VE ACTIVATED MY TRAP!" when a monster tries to maul me and ends up in my pitall / shock trap. This is actually very cool! Haha. That's certainly an unexpected collaboration, but far from unwelcome! Would we have to hunt a White Fa-- I mean, Blue-Eyes White Dragon to get this outfit? Even if MHX or MHXU comes to the west this armor will never be available here. Just like the One Piece armor in MH4 and Tessaiga from Inuyasha in MH3 there will be problems with different rightholders in the different regions. Yeah but what about Dark Magician Girl? Now this is awesome. Please let this make it over here! Nice; Dark Magician has always been my favorite Yu-Gi-Oh monster. Considering what happened with MH4U getting its licensed content removed in localizations I actually doubt it will make it overseas, because the people who own the license for Yu-gi-oh! in Japan sold the rights to the Yu-gi-oh! license to be used in different regions to different people in most regions outside of Japan. @DarkKirby Which is why I play MH3rd for it's licensed stuff. This brings back so many memories of Yu-Gi-Oh! Wow, that's some nostalgia right there!